Hanneli Mustaparta, after Dior (wearing Calvin Klein), Paris, March 2013. Chinese model Fei Fei Sun, after Valentino Couture, Paris, July 2013. American model Lauren Bigelow, Somerset House, London, February 2013. 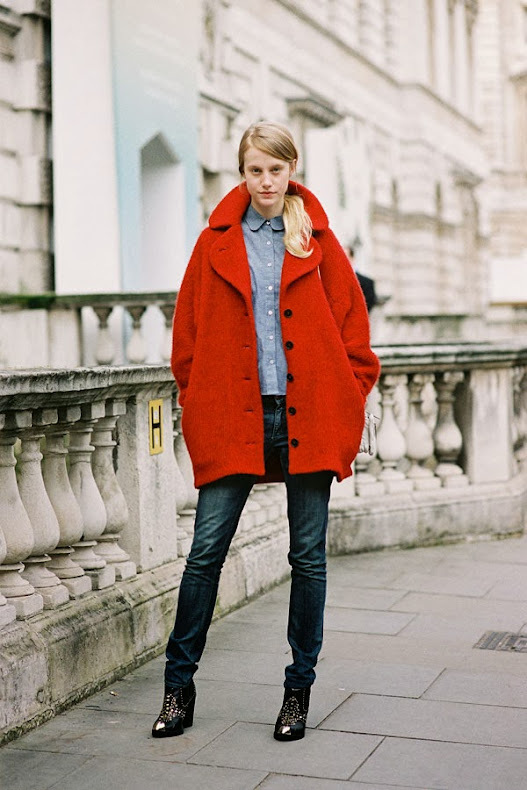 Another, more casual way to style the red coat! (Joanna and Sara in their red winter coats). South Korean model Soo Joo Park, after Iris Van Herpen, Paris, July 2013. Transitioning from Summer into Autumn? Pop a leather jacket over a camisole crop top like Soo Joo has done and team with a pencil skirt. 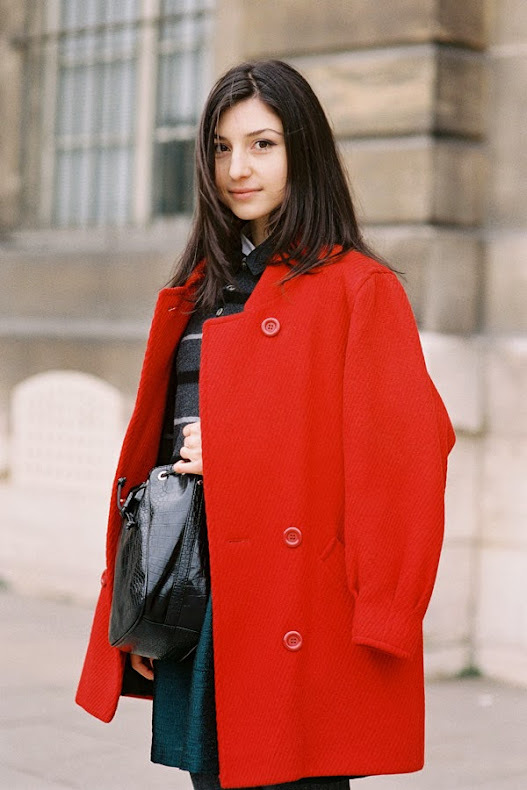 Tank magazine's Caroline Issa, after Dior, Paris, March 2013. Vanessa Axente and Luca Adamik, after Miu Miu, Paris, March 2013. Love the contrast of Vanessa's very sweet, girly dress (and smile!) against Luca's more edgy look (and her choker- wow!). 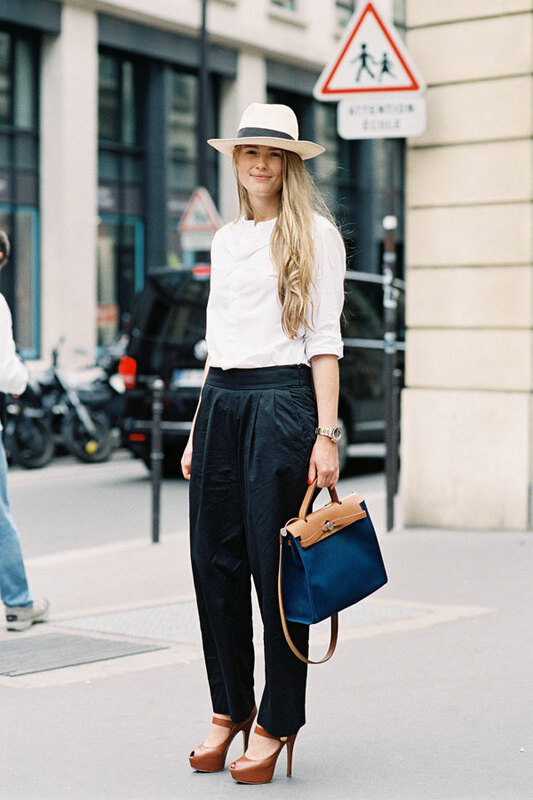 Stylist Elisa Nalin, after Roland Mouret, Paris, March 2013. Dutch model Sanne Vloet, after Ulyana Sergeenko Couture, Paris, July 2013. The classic tough/feminine combination of biker jacket + dress + combat boots. Dutch model Saskia de Brauw, after Louis Vuitton, Paris, March 2013. Daphne Velghe, after Chanel Haute Couture, Paris, July 2013. Soften a pair of leather shorts with a soft and pretty blouse. 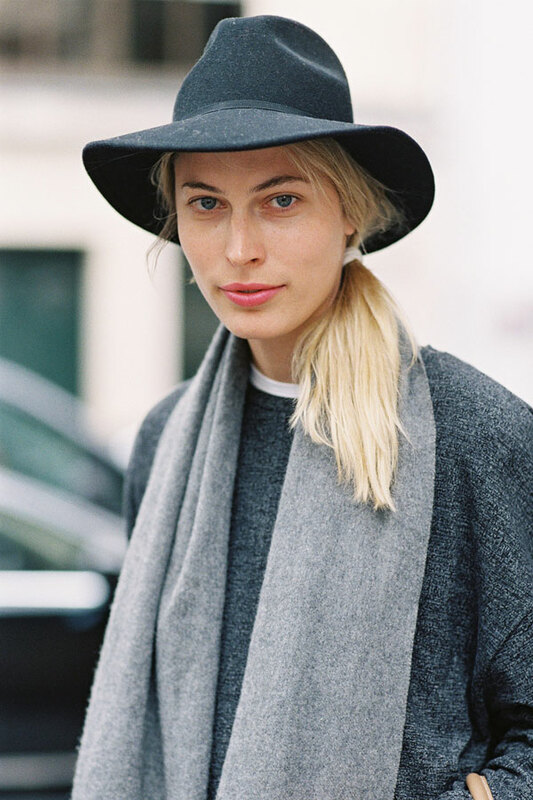 Style Director Harper's Bazaar US, Joanna Hillman, after Isabel Marant, Paris, March 2013. Following on from yesterday's post, another way to style a red coat for Autumn/Winter. After Elie Saab Couture, Paris, July 2013. 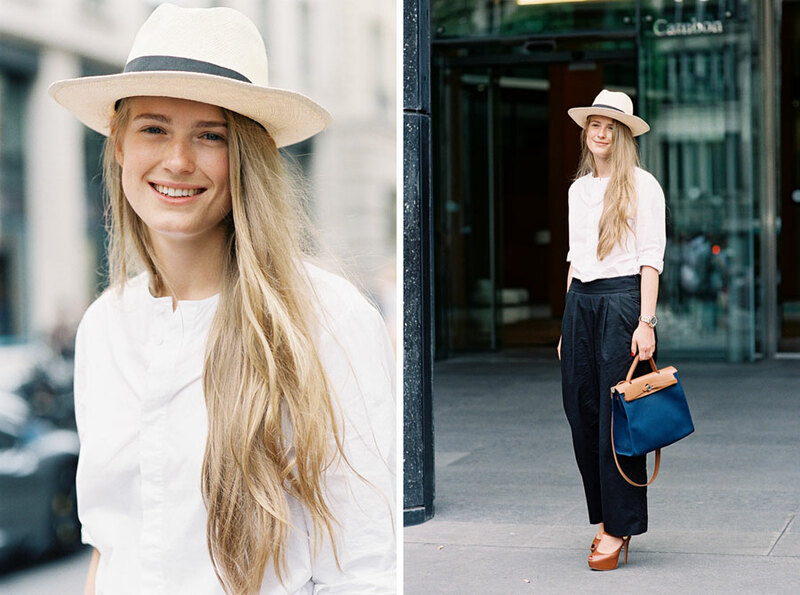 Russian model Irina Denisova, after Christophe Josse, Paris, July 2013. Something casual for the weekend: an oversized denim shirt + super skinny jeans. 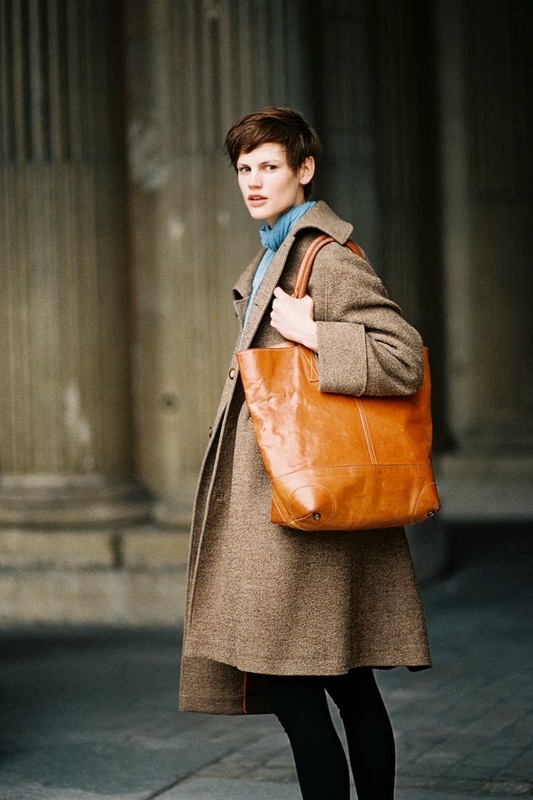 Elena Perminova, Grand Palais, Paris, March 2013. Chinese model Ming Xi, after Dior Couture, Paris, July 2013. 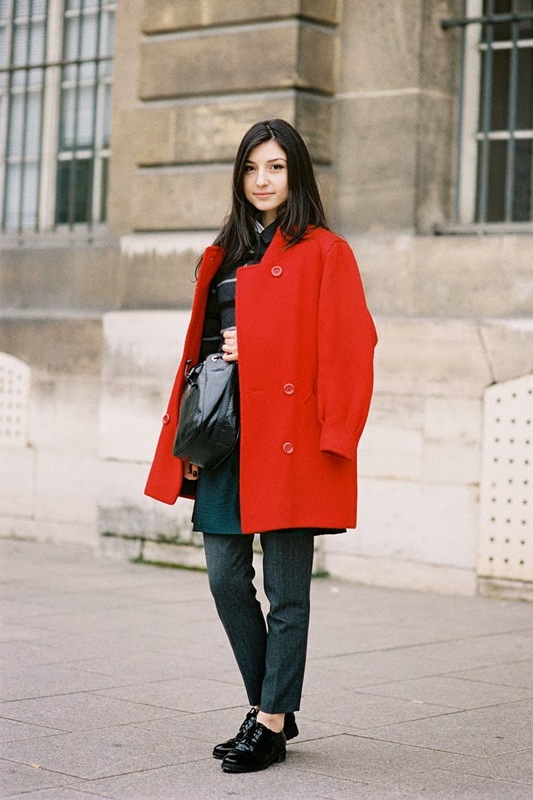 Fashion and lifestyle blogger Sara Constance before Ann Demeulemeester, Paris, February 2013. A beautiful red coat against shades of greys and blacks: the perfect antidote to a gloomy Autumn/Winter's day. 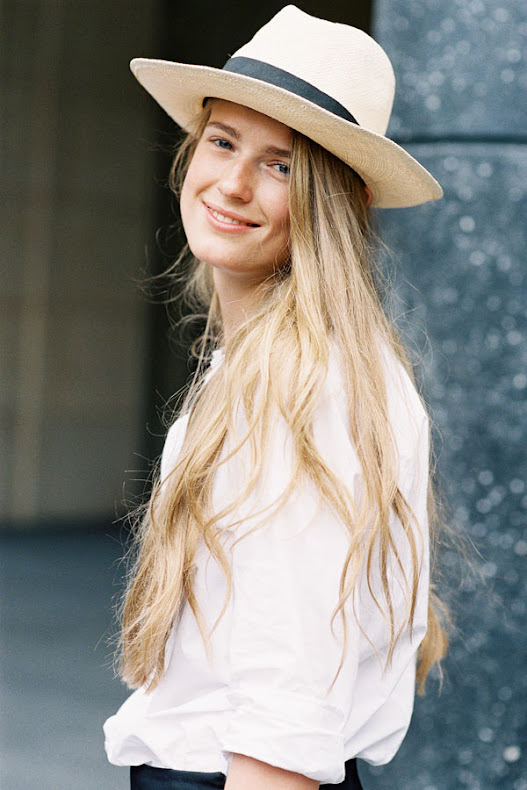 Buyer for Opening Ceremony, Kate Foley, before Kenzo, Paris, March 2013. I adore a dramatic winter coat and Kate's sky-blue fluffy coat is just beautiful. It reminds of another gorgeous coat Kate wore in the previous February. Motto for Winter? Don't be afraid of colour (or cropped pants!). And balance a voluminous coat with a pair of platform wedges as Kate has done. Russian model Yulia Lobova, before Dior Couture, Paris, July 2013. A beautiful, soft summery look on Yulia.....For a more casual look, try a simple crop top under a kimono jacket teamed with a pair of jeans. 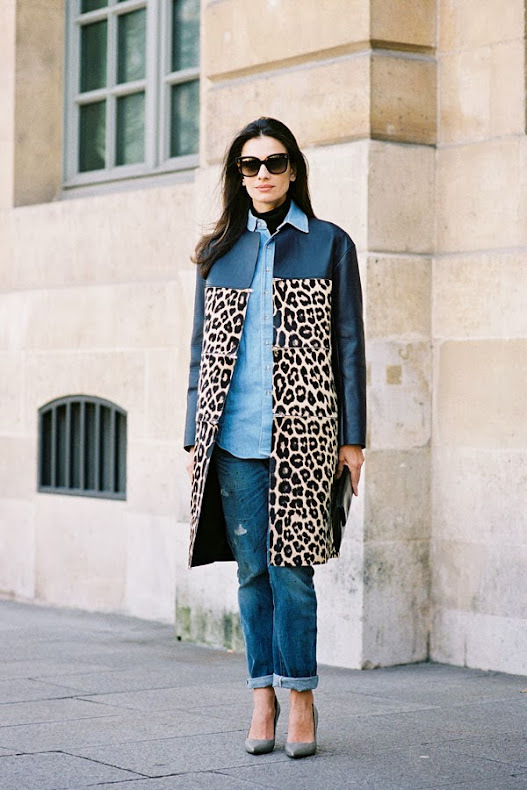 Leila Yavari, Fashion Director StyleBop.com, before Giambattista Valli, Paris, March 2013. You can't go wrong with a couple of animal print pieces in your wardrobe.....and for those not keen on a coat or jacket, try a pair of pumps, clutch or a belt in leopard print instead. 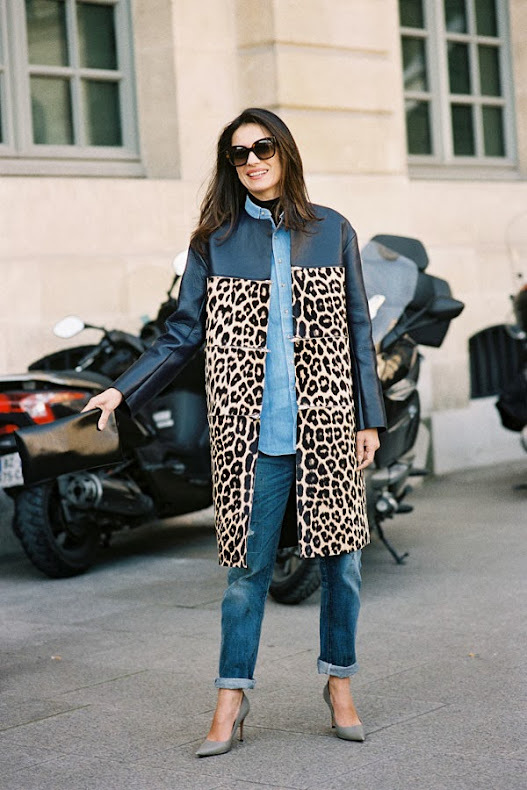 Animal print coat/jacket: Burberry Prorsum leopard-print coat, Sea Leopard combo military jacket, Topshop animal print coat, Moschino Cheap and Chic leopard print blazer, BB Dakota Hazel leopard coat or Thakoon Addition leopard coat with leather trim. American model Samantha Gradoville, after Chanel Couture, Paris, July 2013. The perfect little black (mini) dress. 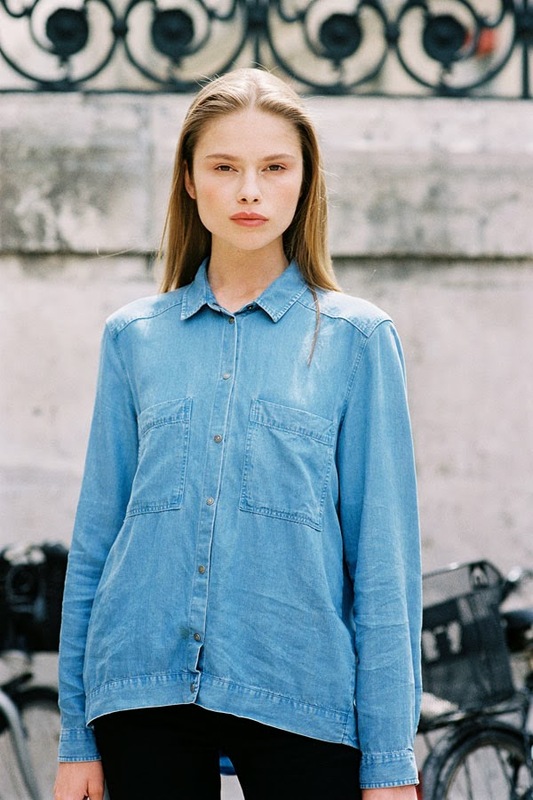 Sophia, after Ulyana Sergeenko Couture, Paris, July 2013. I have just been on a trip to Southern Spain where it was very warm at times (38° Celsius!) - this outfit would be perfect for those temps (perhaps with flats rather than platform pumps) particularly if you are wandering in and out of air-conditioning. Stylish, smart and comfortable. Danish model Nadja Bender, after Donna Karan, NYC, February 2013. 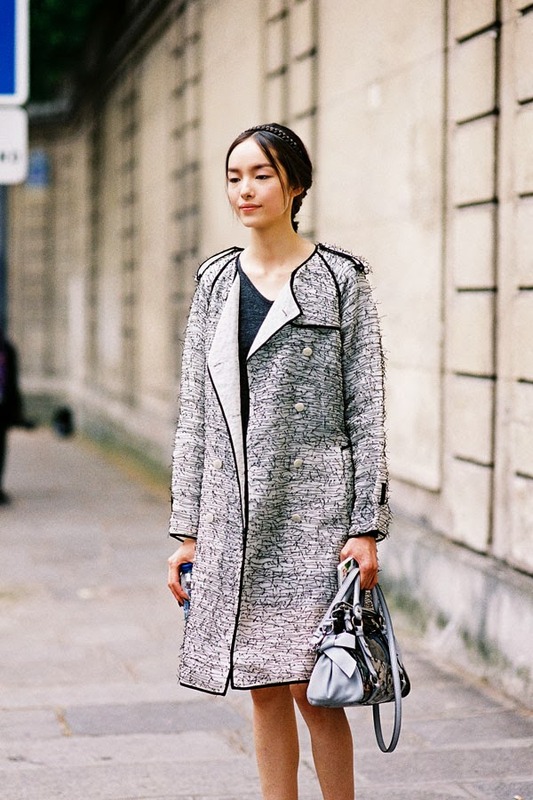 Chinese model Fei Fei Sun, after Isabel Marant, Paris, March 2013. Another great look on Fei Fei.....she has such great style. Model-cool but not unachievable! 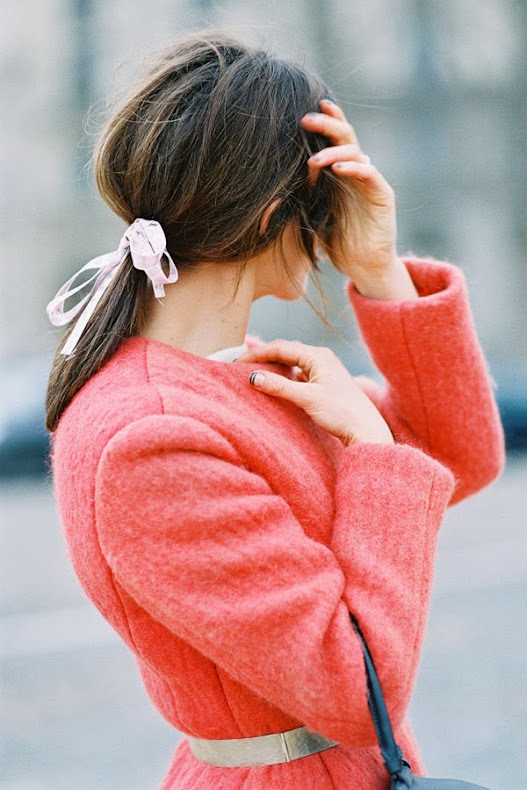 Leandra Medine from The Man Repeller blog, before Sally La Pointe, NYC, February 2013. An oversized navy coat Leandra-ised by the addition of a cute beanie, black and white booties, a gorgeous tri-tone clutch, denim on denim and fiery red lipstick. Do-able in non-fashion week life? yes! Before Valentino Couture, Paris, July 2013. 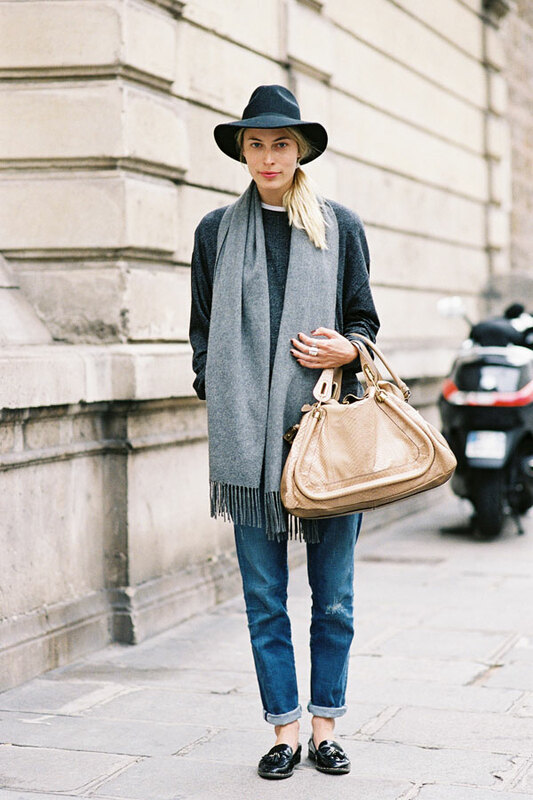 A beautiful look for the change in seasons: shades of grey, rolled jeans and finished with a fedora.